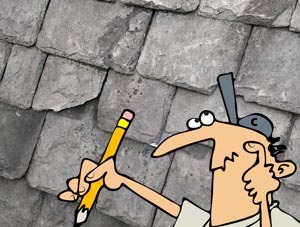 In this section you will find everything associated with slate roofs and slate roof repair, whether it’s how to replace a slate, a slated lead valley, or repairing large sections of slates. If you are looking for instructions how to slate a roof yourself from scratch click the link. For the most part, broken slates are normally visible from the ground 90% of the time, quite often I have a customer ring me to tell me ‘I have a slate missing‘ or ‘a slate has fallen off the roof and onto the floor’. However for the purpose of estimating and checking for less obvious damage to the slates like, slate slippage, cracks in the slate, and nail fatigue of surrounding slates, a ladder must be used to get close enough, and at the correct angle to see these details fully. In my experience I’m always surprised when the one slipped slate I’ve been asked to look at is actually one, and not three or four. 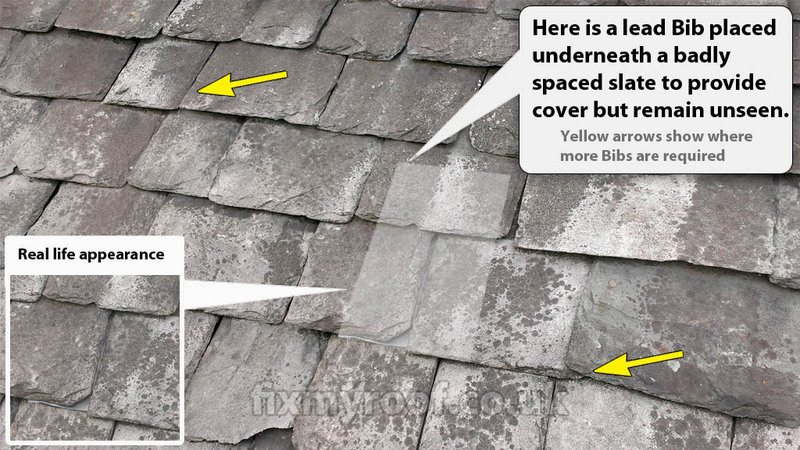 Slate roof problems – In this picture I have re-created common slate leaks and issues. Any of these problems can cause a leak, but I have labelled them in order of importance, the lowest number being the worst. The lower down the roof any of these problems are, the more likely the leak will show as the roof has collected more rain. 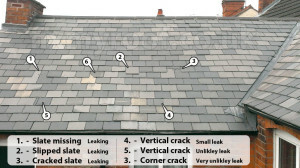 A slate missing is an obvious leak, a slate cracked horizontally may still be visible from the ground but harder to spot. 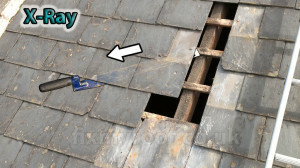 A slate with a large corner missing may be visible from the floor, but slipped slates and vertical cracks in the slates, can be almost impossible to see without a close up inspection from a ladder. Firstly, let’s start with how to replace broken slates or slipped slates. In this video I show you how to replace slates by using the most essential tool in repairing a slate roof, the slate ripper or slate rip. Not only does it show you how to replace a single slate or multiple slates as part of a much larger repair, but also how to understand and use the slate ripper in a professional manner. You can also see how I modify one of these tools to perform better in my roofing tools link at the bottom of the article. 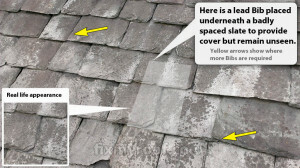 This video shows you basic slate roof repairs, how to replace a slate, slate fixing methods and how to use a slate rip. Hall Hook – This quick video shows how to use a Hall Hook to replace a slate. It’s stronger and more subtle than most other types of repair, but is best suited to newer roofs or just one or two loose slates. Here are some tips and tricks that are not in the video, it’s very difficult when making a video to get across all the important points of fixing a slate roof, without putting in so much information that the video becomes long, boring and irrelevant. So here are some more helpful things I’ve left out for you to read, or not. There’s nothing worse than making a job harder or longer than it should be, especially if you’re in the trade where time is always money. When removing slates from old roofs quite often the slating lath or batten has become dry and brittle over time, this makes it very easy to break when using a slate ripper to pull a slate out, or chop the nails fixing the slates. 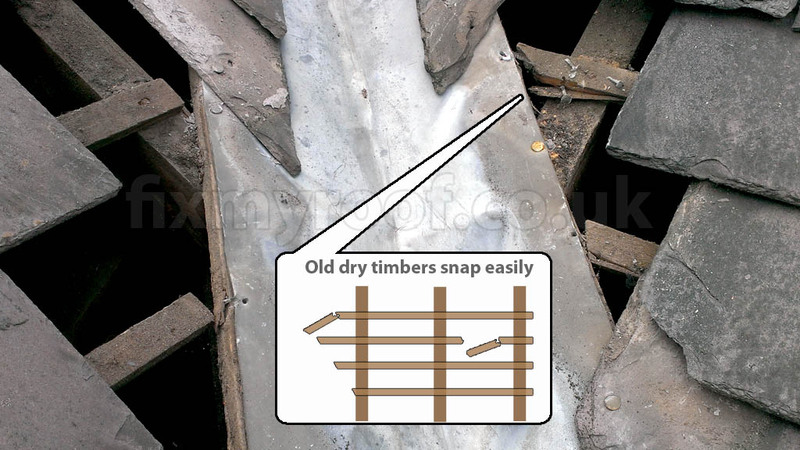 Broken battens – If you break a slating batten, of course it will have to be replaced meaning more slates removed and re-slated again needlessly. 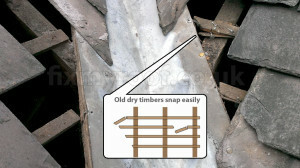 Here is an example of how old dry battens snap. I’ve had a lucky escape here, in the middle or near the edge like the diagram inset, and it would almost certainly have broken. A good tip to avoid broken battens, is that once you have hooked on to a nail you want to remove, turn your slate rip from the downwards nail pulling position, as far left or right as you can. By doing this the pulling force is no longer downwards in the laths weakest direction, but along its length, this will severely lessen the chance of any broken laths. Removing slate nails diagonally – This is particularly handy near gable ends and verges or when working near a valley where laths will be cut and may be unsupported. Of course nail chopping can also be done in the same manner. By far the easiest method of cutting slates is to use a good hand held slate cutter, not only will it cut most natural slate but also artificial man made slate like Eternit and others. When cutting natural slate, always remember to mark the rear of the slate by scratching it with a nail or the cutting blade of your slate cutters. This way when you cut down the lines you have marked on the rear of the slate, spelching will happen on the top visible surface of the slate. When you turn over the slate to look at the front face, it will now have a much more natural riven slate look that will marry in with the rest of the roof. Cutting roofing slate – This video shows not only how to cut slate easily using various methods used by professionals, but also how you can replicate this at home with the minimal specialist. If you’re going to be cutting lots of thick slates above 5mm thick (¼ of an inch) a slate guillotine can be purchased at relatively low cost, I find they work best when screwed to a flat piece of timber for stability. If your slates are very thick like Swithland slate for instance, a diamond tipped cutting blade may be a better option, and the riven look can be added later by gently hitting the edge of the slate with a hammer, or feathered with the diamond cutting blade in a small angle grinder until the right look is acquired. Slate guillotine – Some slate guillotines have batten hooks fitted so that you can hook it onto a lath or batten and work in situ up a roof. 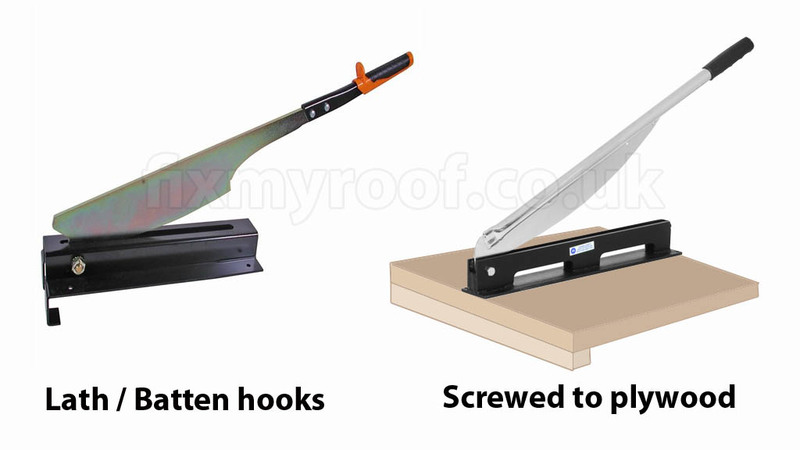 Another option is to make your own by screwing a guillotine to a piece of plywood and making your own batten hook with a spare piece of batten, this makes it stable and usable on the ground too. Traditionally a slater’s hammer is used to punch through the underneath of the slate by hitting it with the spiked end of the slating hammer, in the place that you require the hole. If the slate is supported against something with a hard edge, the slate should hole easily. These days with the advent of very good cordless drills and titanium coated drill bits I tend to drill holes in the desired position for small jobs. Not only does this method reduce slate breakages, but if necessary the timber batten can also be drilled should it be bouncy or brittle, again saving wasted time repairing accidentally snapped slating lath. You can also hole a slate very close to the edge if required, like the practice of ‘top nailing’ a slate. How to punch a hole in slates – This video shows you some of the easy methods of how to put a hole in slate. Whether it’s a thick or thin roofing slate, you can use new or traditional methods using specialised kit or standard household tools. Installing a bonding gutter – This video shows a roof repair and the fitting of a bonding gutter between a slate and a tiled roof, but it will also fit two slate roofs together as well. You can use either a dry bonding gutter or the standard bonding gutter. 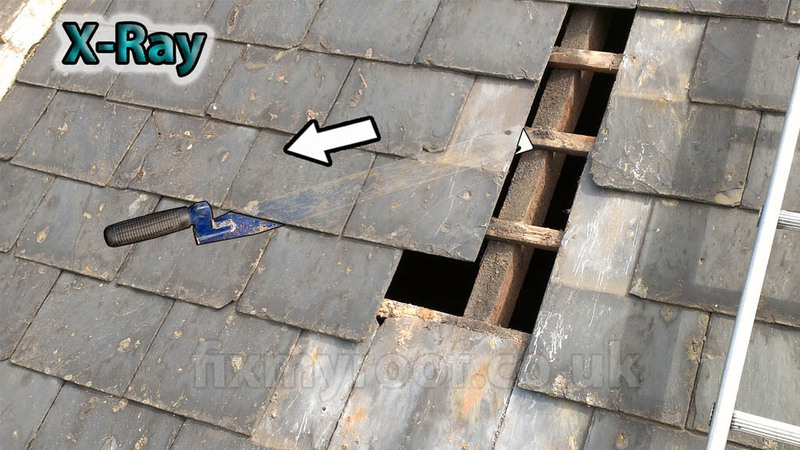 Lead valley repair in slate roof – This video shows you the correct and traditional method of repairing a lead valley in a slate roof. Also includes the basics of spotting fatigue splits and cracks. Sometimes horizontal or vertical spacing of individual slates can go wrong, or a slate can have a vertical split right up the middle. This is especially true of vernacular slate or stone roofs like Cambrian slate, Swithland slate, Ingleton slate, Sandstone slates, Pendlestone and Limestone slate roofs. There is a considerable amount of skill required in laying one of these roofs as they have to be carefully graded for length and width before any slating can take place. Unfortunately mistakes are made, often through the inexperience of a roofer with these types of materials, or the inability to acquire enough of the correct matching slate to space and grade the roof correctly. 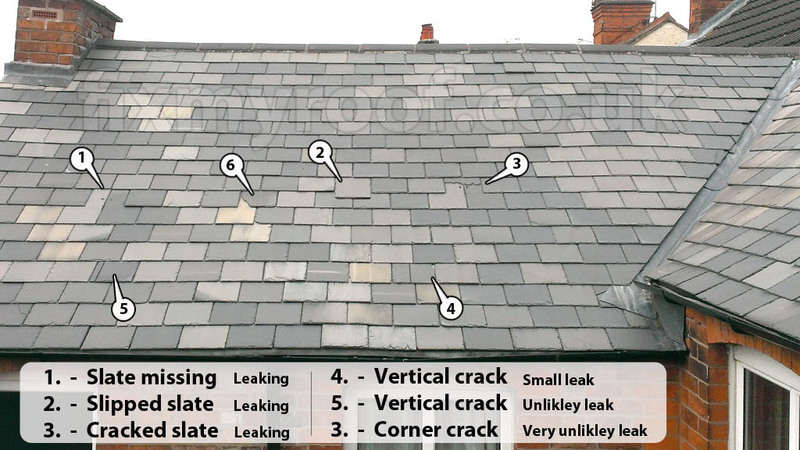 Lead Bib slate repair – If the roof hasn’t got too many mistakes a good method of repair is the lead Bib, it’s simply a section of code 3 or 4 flashing lead cut large enough to sit under the faulty slate or bad overlap to make it waterproof, and the repair invisible. Normally friction alone is enough to hold the lead bib in place.